Ata Int. 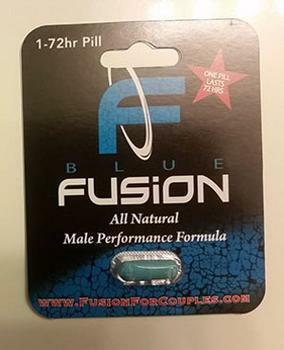 Inc. is recalling all lots of Blue Fusion capsules, a dietary supplement marketed for male enhancement. The product contains sildenafil, tadalafil, desmethyl carbodenafil, dithiodesmethyl carbodenafil, scutellarin and daidzein, making it an unapproved drug for which safety and efficacy has not been established. Blue Fusion capsules, which are packaged in 1-count blister packs, UPC code – 7.48252. 66460.0, was sold nationwide in retail stores and on the internet from January 2015, to March 2019. Ata Int. Inc. is notifying its customers by email and is arranging for return of all recalled products. Customers who purchased the recalled product should stop consuming it, return it to place of purchase or dispose of it. Consumers with questions regarding this recall may contact Ata Int. Inc. at (657) 888-4041 Monday through Friday from 9 a.m. to 5 p.m. (PST) or by email at bluefusioncorp@gmail.com.